Review of Halley's Casino (book 1) - HERE! 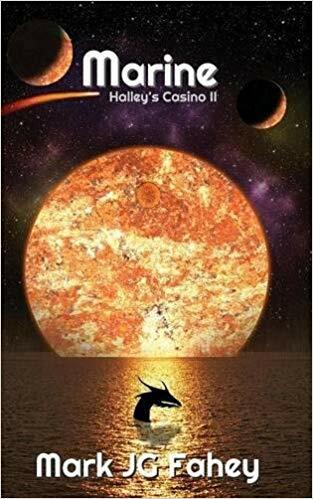 Marine - book two in the Halley's Casino trilogy - opens on the watery planet of Marine following a new main character, LeBeau who is the cousin of the Prime Minister of Telvon 3, TeeceeFore. He had just inherited the estate of an old friend, Professor Gabriel Pheet. But behind the facade of heir, he was also on a second an more dangerous mission to search for a lost Triopelian Star Chart. Several factions were desperately working to be the first to find it, so danger and intrigue surrounds him. At the same time, we continue to follow Nebula York on Halley's Casino. A deadly pair has landed there through misdirection on the part of the professor. They are determined to find the star chart first, and anyone in their path is in danger. When they discover they have been sent on a wild goose chase, they head back full speed to Marine. Nebula and a few others race there as well. Although a little more serious this time around, Marine has that same madcap feel to it. Whether on Halley's Comet, on the surface of Marine or deep in the caves under it's ocean, the plot still unexpectedly turns left on a regular basis, continuing the amusing, madcap feel found in Halley's Casino. A moon that rising out of the ocean, an android with an unusual sense of humour, a race evolved from tadpoles, a sentient underwater creature and of course John Lennon are just a few of the elements wound together in the plot. Marine is a fun and easy read that is sure to bring a smile. 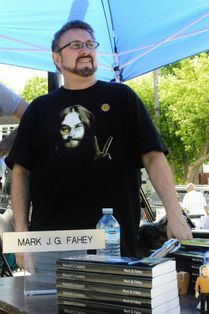 Read a fab author interview HERE!